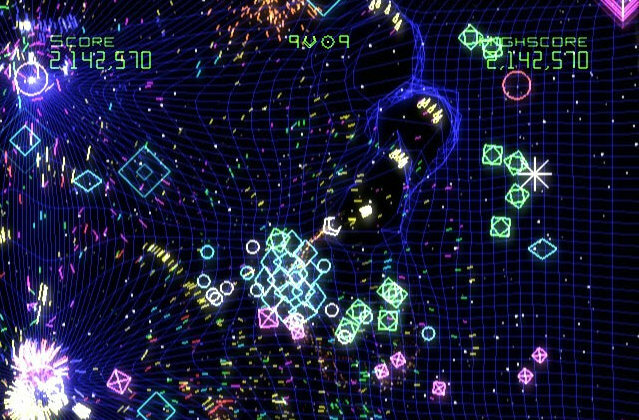 Geometry Wars Galaxies is a strange game that has a 80's and 70's retro feel to it but with a touch of modern gameplay and technology as the gamer must shoot a variety of objects in order to be hopefully awarded one of three medals and of course proceed to the next level. The game is reminiscent of those classic "shoot-em up" games such as Space Invaders or Galaga and the developers have ensured that the wiimote and nunchuck work quite well with the gameplay as opposed to traditional controllers. EXTENSIVE SINGLE-PLAYER GAMEPLAY – Expands the Geometry Wars universe with Galaxies: an original, solar systems based, single player campaign with new and dynamic planet battle-grids. ALL NEW MULTIPLAYER MODE – For the first time ever play multiplayer Geometry Wars: Retro Evolved. Play in many ways with or against your friends in the exciting multiplayer Geometry Wars world. 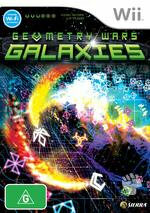 NEW BATTLE DRONE – Geometry Wars: Galaxies introduces the all-new Battle Drone and Geom currency. By using Geoms to purchase upgrades, the player will be able to develop the characteristics and personality of the drone, aiding the journey through battle-torn and increasingly aggressive galaxies. NEW ENEMIES AND WEAPONS – Geometry Wars: Galaxies will have even more enemies and weapons to maximize high scores that can be placed on the Nintendo Wii online leader boards. WII AND DS LINKED CONTENT – Unlock new content when you link up your DS and Wii versions together. Combine high scores for Elite leaderboard rankings. To interact with the gaming environment, the player must use the stick to navigate the space craft with the wiimote used to eliminate your opponents. Your space craft also has access to a variety of weaponry besides your stock standard lasers such as "Z" for smart bomb which brings back fond memories of Defender. The smart bomb is great for destroying your enemies around your craft and assists in gathering your thoughts before the next onslaught. A nifty little feature of Geometry Wars Galaxies is the ability to upload your scores to display your prowess as a Geometry Wars Galaxies master. The developers have also ensured that the title doesn't become too stagnant as the gamer must collect geoms as they progress through the game which allows you to unlock new levels and behaviours for your "wizard" familiar type drone which assists you in beating an obtaining those high scores. The title features a great cooperative play as you can play through a variety of galaxies with a friend or battle it out in the Retro Evolved mode for the ultimate high scores. There's even an entertaining versus mode so you better be fast on the trigger. Graphically, Geometry Wars Galaxies is impressive looking game on the Wii with that classic retro feel and almost has this 3D type atmosphere to it. Although not as impressive as the original XBox 360 version on PGR, the title has enough special effects and different levels to really set this game apart. Best of all, the Wii version has a variety of new ships and galaxies to play. 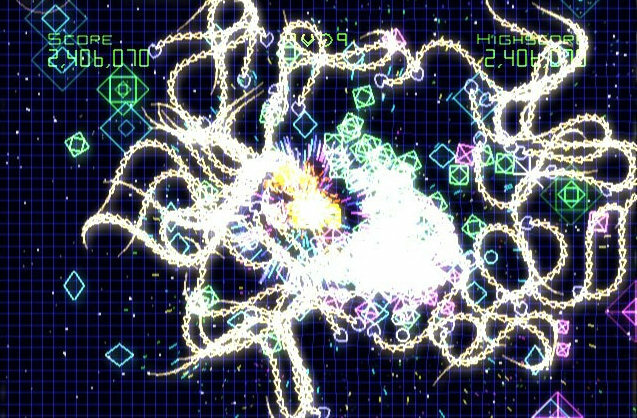 Another bonus of Geometry Wars Galaxies on the Wii is the great soundtrack that matches the genre perfectly and add in a variety of great "retro" sounding sound effects and you have a game made in gaming heaven. In conclusion, Geometry Wars Galaxies is truly a fun game that may not have the spectacular graphics but has good old fashioned gameplay with a modern twist. Definitely a game for the entire family!